The Leipzig chamber choir Kammerchor Josquin des Préz has been acclaimed by press and public alike for its exceptional musical sensitivity and sense of style. The ensemble has enthused audiences through its blended, powerful and well-balanced choral sound, as well as the excellent quality of the individual voices. Founded in Leipzig in 1987, the Kammerchor Josquin des Préz has given over 400 concerts to date and has established a reputation as one of the leading early music ensembles. Four conductors have shaped its musical development: Raik Fischer (1987–89), Steffen Kammler (1989– 97), Uwe Witzel (1997–2002), and Ludwig Böhme, who has been artistic director since 2002. 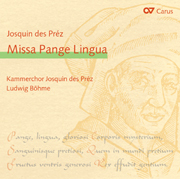 Under Böhme’s direction the choir launched “Josquin – Das Projekt” – a unique project worldwide to perform the complete works of Josquin des Préz. 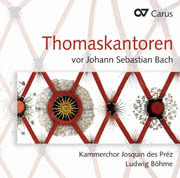 Since 2004 regular concerts have taken place in St. Thomas’s Church, Leipzig, examining Josquin’s works in the light of their relationship to musical developments of all subsequent eras. “Josquin – Das Projekt” is now a firm fixture in the Leipzig concert cal - endar, and the chamber choir is one of the leading ensembles of its kind in the music city of Leipzig. 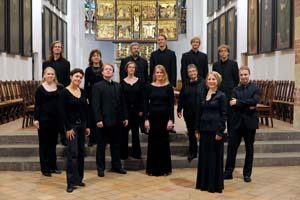 Although principally an a cappella ensemble, the choir also performs regularly with instrumental ensembles, most recently in November 2009 in an acclaimed performance of Claudio Monteverdi’s Marienvesper and in April 2010 in a live broadcast of Bach’s Easter Oratorio on Deutschlandradio Kultur. 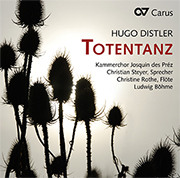 The Kammerchor Josquin des Préz has won prizes in competitions, most recently with “outstanding success” and a 2nd prize in the 8th Deutscher Chorwettbewerb 2010 in Dortmund, where it also won a special prize for the best program in the competition. This was preceded by winning the 5th Sächsischer Chorwettbewerb in June 2009. Numerous tours have taken the singers throughout both eastern and western Europe. They are popular guest artists at festivals such as the MDR Musiksommer, Kultursommer Rheinland-Pfalz, and the Bach Festival Leipzig. The ensemble has been chosen by the Goethe-Institut as cultural ambas - sadors for Germany, travelling in this role to Albania in 2006. Radio broadcasts on MDR, WDR and DRadio Kultur together with CD recordings, in - cluding the rarely-heard Penitential Psalms by Orlando di Lasso, illustrate the group’s high artistic quality.